How my doctor can improve your marketing skills. It was an innocent medical encounter, long ago, having nothing to do with marketing. And yet, it yielded some of the smartest marketing advice I’ve ever received…and then passed on to others. Once an enemy, now a bestie. At the time, I was overhauling my nutrition and diet strategy. During my annual physical, the doc asked me how well (or not) I was adapting to the new habits I was aspiring to achieve. I then let loose a tirade about how bloody hard it was to drink eight glasses of water a day. Who drinks that much water?…I said. I’m not a camel preparing for a desert journey…I said. Water is boring…I said. And on…and on. Damn the man. Did he have to be so sensible when I was so clearly irrational while detoxing from my soda-juice-coffee habit? I instantly felt sheepish and agreed that yes, I could manage two glasses a day. Fast forward fifteen years. I’m sitting with an innkeeper client who’s got an overwhelming to-do list, and is ranting about the pressure of doing daily social media posts. I’ve got a million things to do…he said. I don’t have time to think of new things to post every day…he said. Social media is annoying…he said. Here’s the thing folks. We place requirements on ourselves that are meant to be guidelines…and yet we treat them as sacrosanct law. Guidelines must be weighed against reality, and it’s often perfectly fine if a compromise is achieved. Are daily posts on Facebook recommended for a brand? Yes. Is three per week still better than none? Yup. In marketing, frequency is great, but consistency is VITAL. So, can’t do monthly newsletters? Do them bimonthly. Can’t do weekly blog posts? Do them biweekly…or monthly. Overwhelmed by trying to keep your Facebook, Instagram, and Twitter updated? Pick one and really OWN it. So…relax, people. Be kinder to yourself. Make consistency your priority, and then decide on frequency you can live with. You can always increase when the rhythm gains a foothold in your life. 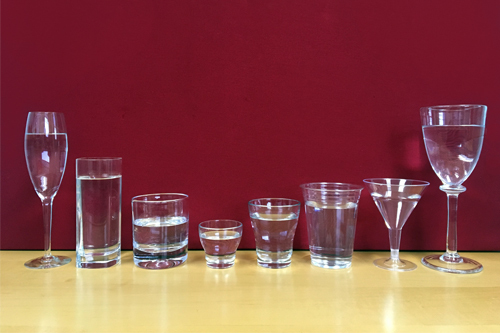 Case in point: I’m up to an eight-glass-a-day water habit now. I mean…it only took me fifteen years but still. Progress.